The highest ski resort in Europe, Val Thorens has many blessings - one of which is that the majority of the best places to stay in Val Thorens are ski-in ski-out. It's also has some of the most spectacular scenery in Les Trois Vallées, one of the longest ski seasons - in a good year there's skiing between November and May - and has extremely varied terrain, from nursery slopes to challenging on-piste routes and even more exciting off piste options. And if you include the other two resorts of the Three Valleys, Meribel and Courchevel, then the choices are vast! Just like the skiing area! It is a purpose built resort, mostly constructed since the 1970s. Because of that the standard of accommodation is higher than in many resorts. There are plenty of hotels with between three and five stars, traditional lodge style accommodation, self catering apartments and chalets. Even a Club Med..
Val Thorens is very much a skiers and snowboarders resort. There's lively apres-ski, but not a lot to do in the day if you're not out on the slopes. It is in a spectacular spot though, at the head of the Belleville Valley, surrounded by a dramatic horseshoe of alpine peaks. The view from the top of the Cime Caron cable car includes Mont Blanc. The restaurant, at 3200metres, is an impressive place to eat. In the summer there’s great climbing, hiking, mountain biking, paragliding and fishing. In the last few years Val Thorens has been given a style facelift. Some of the 70s buildings have had a makover. With the investment came the well known chefs then Michelin Stars, improving the quality of restaurant options by a few thousand percent. Val Thorens also has numerous boutiques, cafes, bars and nightclubs in the pedestrianised heart. Above the resort, in the Plein Sud area, there are a number of chalet style residences, some of the best places to stay in Val Thorens if you want to ski in and ski out. Lower down you'll find some of the best choices if you're looking for luxury. 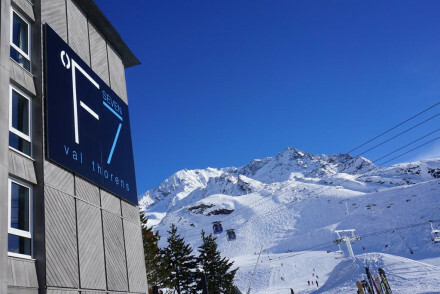 The Hotel Guru's pick of the best places to stay in Val Thorens range from unbeatable value family friendly properties to super cool five star luxury on the piste. 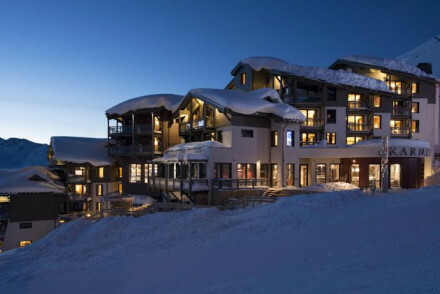 The Hotel Pashmina in Val Thorens is a luxury lodge with 50 gorgeous rooms and spacious suites, a gourmet restaurant and easy access to the slopes. Romantic and pampering. For a near perfect accommodation choice in Val Thorens try the Hotel Fitzroy, five star, newly refurbished and in the heart of the resort. This hotel has a ski shop, easy access to the slopes, classic Savoyard decor, an elegant spa and pool, an excellent restaurant and a choice of rooms or family suites. 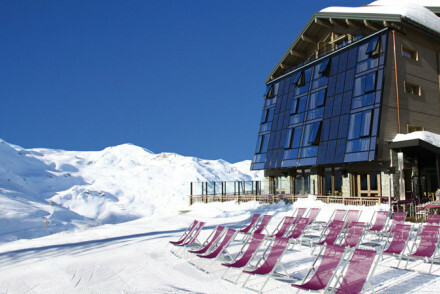 For super cool, super modern, super five star, one of the best places to stay in Val Thorens is Altapura. It has all the traditional ski lodge motifs, but updated in a hip way. There's still the exposed wood, stone and fur, all in pale neutrals and in modern shades. Brimming with five-star excellent, the Hotel Koh-i-Nor is a contemporary beauty right on the slopes. There are 98 rooms and suites - some very luxurious, plus a Michelin-starred restaurant with an extensive menu and a spa. 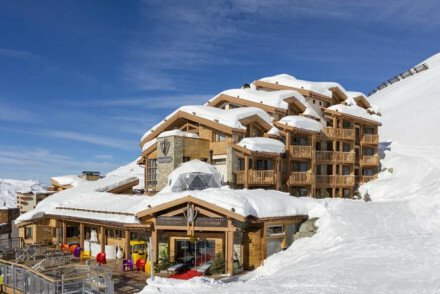 The Hotel Val Chaviere in Val Thorens is an excellent value, family friendly hotel in unbeatable ski-in ski-out location right on the piste. Plus you’re just a few minutes walk from the resort. The bar and restaurant are welcoming and Thursday is fondue night. 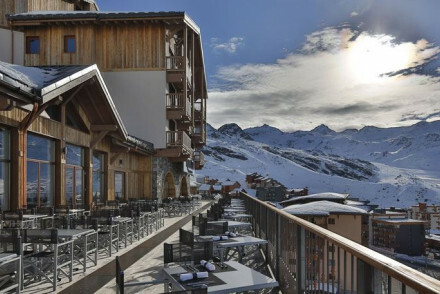 Le Val Thorens is a reasonably priced chic alpine hotel with 83 rooms and suites, an excellent restaurant and lively bar. Right on the slopes and next to a ski school! Le Hameau du Kashmir is a collection of stylish rooms and suites on the slopes of Val Thorens, with living rooms offering spectacular views. The hotel pool and sauna are a retreat with massages available. There are two restaurants and a lounge bar. The Hotel Le Sherpa is a popular 56 room hotel known for being family friendly. Typically Savoyard with a spa and hammam. 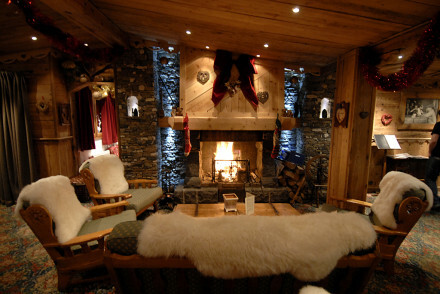 The hotel has three lounges, a bar, log firs and an open fire grill in the restaurant for raclette and fondue evenings. 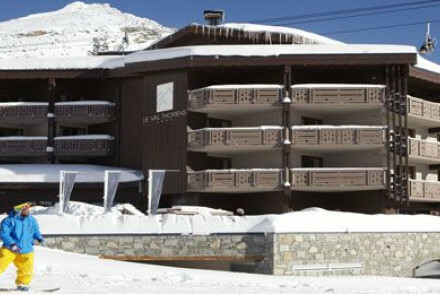 if you're here with your family one of the best places to stay in Val Thorens is the Hotel des 3 Vallees. There are 33 rooms in the hotel and four cosy family suites. The breakfast buffet is of epic proportions, really setting you and your little ones up for a day on the slopes. Rooms start at less than £65 per night, so it's also a good choice if you're looking for good value for money. If you’d prefer to stay in an apartment or private chalet we recommend you visit our online partner, Booking.com. Val Thorens is two and a half hours from Geneva airport. Chambéry is closer. Lyon and Grenoble might also be useful options depending on where you’re flying from. There’s a regular shuttle bus from the nearest station, Moûtiers to Les Menuires and Val Thorens. And it takes about an hour. Be aware that cars are banned in the resort - though you are allowed to drop off luggage. Because the season is so long here it can be hard to gauge the best time to visit Val Thorens. Christmas and New Year are very popular but it’s much quieter in January. There are French school holidays in February so book ahead if you want to visit then. Come March the snow starts to decline - but it depends on the year and the snowfall. If you want to see the mountains snow-free then June, July and August are for you. 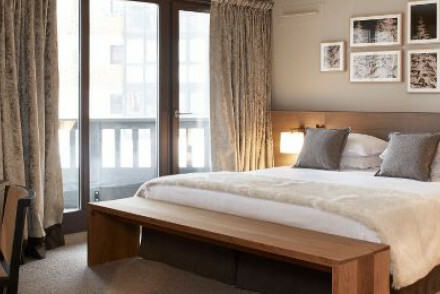 A chic luxury alpine hotel that caters to groups of friends, families, and couples. Fabulous rooms and suites have light wooden surfaces, fireplaces, and cow skin throws. Excellent restaurant, lively bar, ski hire, and a top of the range spa. The five star newly refurbished Fitzroy is at the heart of the resort. In-house ski shop, and then straight onto the slopes. Classic Savoyard and contemporary interiors, wood, stone and leather. Beautiful bedrooms, family suites, an elegant spa and pool. Excellent restaurant. Near perfect. Spa - Beautiful spa, with hamman, swimming pool and beauty treatments. Restaurant - La Table du Roy is one of the best restaurants in the resort. 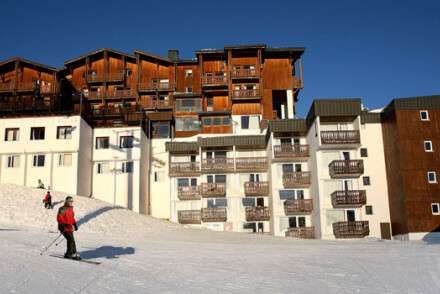 Opened in 1976 this hospitable, popular and family friendly hotel is close to the piste and resort centre. Traditional and typically Savoyard, the hotel offers a spa, hammam and beauty treatments. Three lounges, bar, log fires and the restaurant has an open fire grill, fondue and raclette evenings. Sitting Room - Three comfortable sitting rooms, plenty of space for children and quiet places to relax with a book in front of a log fire. Restaurant - Excellent, generous buffet breafast, good food, and Savoyardes specialites including memorable fondue. Skiing - Good location close to piste. Private ski lockers with heated boot warmers. Right on the slopes of a world-class ski resort, this classy 4* offers winter sport and aprés heaven. Cheerful 70s décor features bright colours and vintage prints. You'll find a sauna and steam room for tired muscles, two excellent restaurants, great wines and bars with live music and DJ sets. Super modern, super cool, super Five Star. Not your average Alpine hotel. Bedrooms and suites with all the gadgets, sleek lines, and fabulous mountain views. Stone and light wood dominate throughout, from the spa to the restaurants, bars, and terraces. Majestic. Brimming with five-star excellence, Hotel Koh-i-nor is a superb, contemporary hotel right on the slopes. Fitted with deluxe suites, an extensive spa, a michelin recommended restaurant and superb views, it's the perfect place to unwind after a day on slopes. A family friendly alpine gem. Skiing - Ski-to-door access, ski pass vendor, ski equipment hire, ski storage and ski school all onsite. Great walks - Excellent walking in the nearby Vanoise National Park. 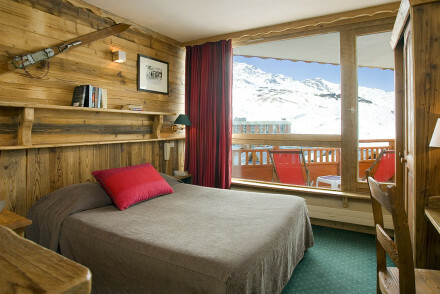 Stylish suites on the slopes of Val Thorens resort. Each suite has two plush ensuite bedrooms and a living room with stunning mountain views. Retreat to the hotel's pool and sauna to soothe your ski wearied limbs. Perfect for groups or families. Total relaxation - Apres ski heaven with sauna, massages and indoor pool, as well as two restaurants and lounge bar. Great walks - Spend an afternoon exploring the beautiful walking routes in the Vanoise National Park. Find luxury in its truest form at this gorgeous lodge. Spacious suites boast wood paneling, fireplaces and glorious bathrooms. A superb spa will cater to your every need and the gourmet restaurant serves traditional dishes in relaxed surrounds. With easy access to the slopes this is a real winner. Romantic Break - The ideal escape for two with cosy fires, a luxury spa and wonderfully romantic rooms- especially the igloo under the stars! Hideaway - A pampering and indulgent base to return to after a day in the Alps.